This interview was organized and could not be completed without the great help of David Canter and www.DECAgent.com. Strauss : What was your favorite team growing up? Soliai : I grew up loving the San Francisco 49ers. Strauss : What is your favorite memory from Utah? Strauss : What was your draft day experience like? 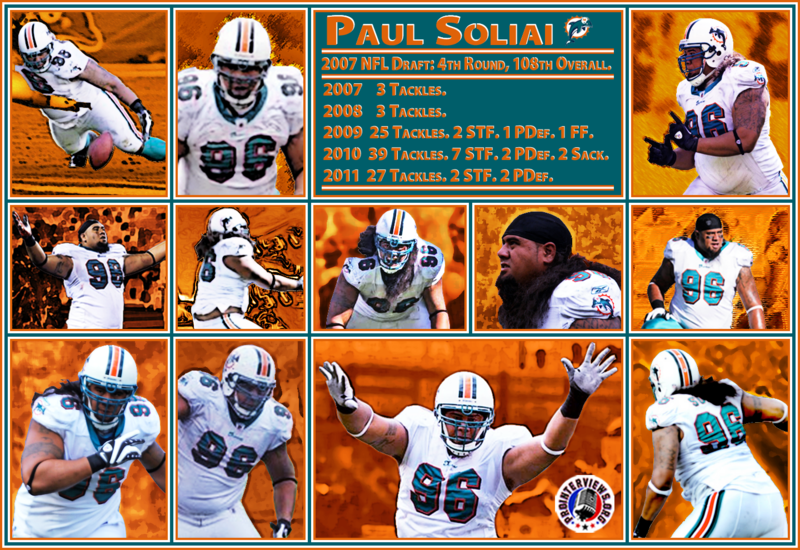 Soliai : It was a great time. I had a big party with my entire family in Las Vegas and about 50 people came and cooked a barbecue and it was awesome. Plus, I landed with a first class organization, the Miami Dolphins. Strauss : What is your favorite memory as a Dolphin? Strauss : Is there any charity that strikes your particular interest? Soliai : My wife and lost a lot of family in the Tsunamis that hit American Samoa last year. So, we do anything and everything we can to help out our home country. Strauss : What is an experience you have had that changed your life? Soliai : Becoming an NFL player is a dream come true. It allows me to help my family and contribute to society as a role model and person! Soliai : Strawberry… because the color is big and bright and red and they grow in the wild which is a lot like me. Strauss : What is your favorite quote? Why? Soliai : What goes around comes around because it’s totally true. Strauss : For someone aspiring to play football in the NFL, do you have any advice for them? Soliai : Work hard! Be smart! Hit your books and never quit or give up your dreams! Soliai : I’m going to working hard to be the best football player possible and their support and love is tremendously appreciated and I truly thank them. They are my motivation. Strauss : Thank you so much for your time Paul! Soliai : Not a problem, thank you. Thank you so much for this interview Max! I truly enjoyed it and learned a lot about Paul. I look forward to reading more interviews from you. I liked his comment about it being his best year personally but it was tough year team wise. I think he will definitely become a great asset to our team! Great job Max and thank you Paul for taking time to share with your fans! It was a good interview for Paul, please asked him next time, how is his mother, did she worked hard to get him where hes at right now, I heard she was the back bone on Soliai, getting to his goal for his future….I’m sure he knows that, but probably doesn’t want to mention his aggresive mom, if you have a chance,,,,sneak that question to him……Thank you.